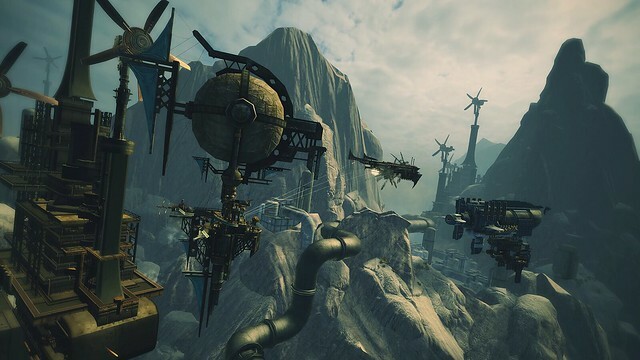 The team-based steampunk aerial shooter will launch as a PS4 console exclusive, complete with PC cross-platform play and voice chat. We’re thrilled to confirm that we are bringing the heart-pounding action of Guns of Icarus Alliance to PS4 on May 1, 2018. 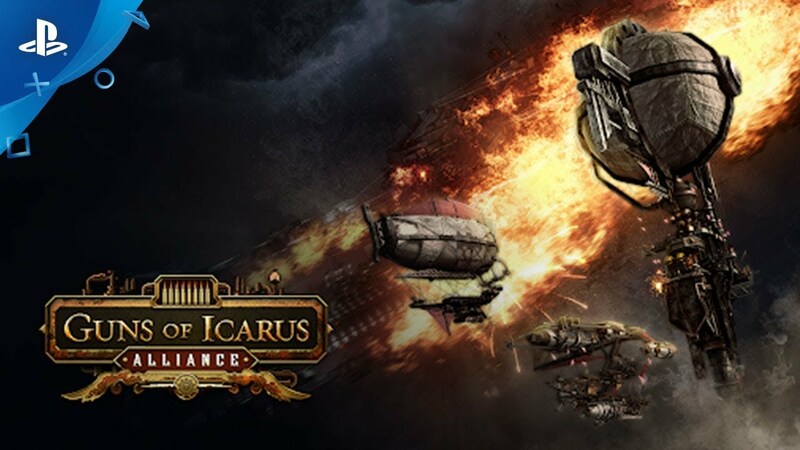 Starting today, you can pre-order Guns of Icarus Alliance at a 25% discount while also receiving a ship figurehead and a costume set forged exclusively for those who pre-order. 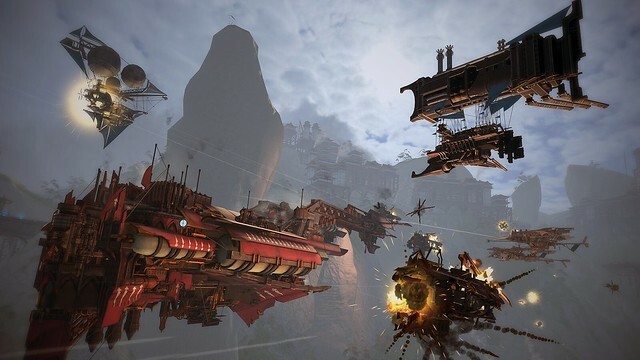 Guns of Icarus Alliance: PS4 Edition is the ultimate steampunk airship combat game, complete with an ongoing war between six elite factions vying for control of a world ravaged by machines. Up to 32 players can engage in epic PVP airship battles, with 4 players manning each ship. Or team up with your faction to take on the AI in heart-pounding PVE skirmishes. Take the roles of Pilots, Engineers, and Gunners and work with your crew towards victory. Repair your ship’s armor, gun down enemy balloons, and deftly weave in and out of combat to dominate the skies in a variety of game modes and maps. In this ever-changing universe, a team’s successes and failures constantly shape and reshape the world based on who dominates the battlefield. In the skies of Guns of Icarus, you and your crew triumph or perish, together. 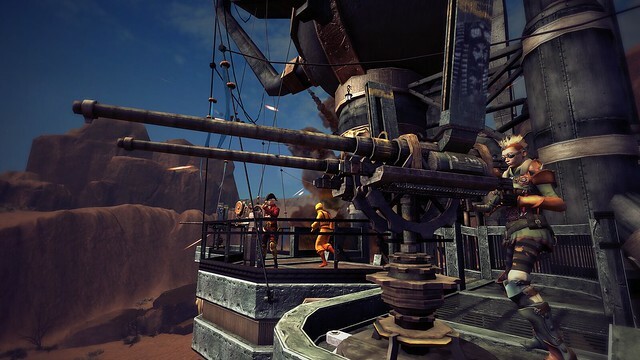 Since day one, the heart and soul of Guns of Icarus has been the idea of teamwork. However, we didn’t want to simply create a game where individuals just happened to be placed on a team together, with everyone focusing on their individual kill/death ratios. We sat down and really thought about what the concept of a “team” meant to us – and that ultimately boiled down to the understanding that each individual member should feel like a part of something that can only work if everyone contributes. We didn’t want the opportunity for a single player to “carry” a match, but rather to encourage communication, strategizing, and sharing a single communal goal that can only be achieved through cooperation and shared effort. The ship is the team’s collective life bar – when the ship goes down, the crew goes down with it. Every member of the crew plays an integral role in not only maintaining the “life” of the ship, but also weakening the integrity of enemy ships as they work cooperatively towards a shared victory. When we made the decision to release the game on PS4 as a console exclusive, it was a priority for us to find a way to ensure that the new release would not be a point of division, but rather a way for us to grow our community. PlayStation affords us the opportunity to seamlessly bring console and PC players into the same match, and it was the perfect fit. However, just allowing PlayStation 4 players the chance to play in matches with players on other platforms wasn’t enough. We wanted to be sure that all players had the opportunity to experience the full teamwork experience – which is why we also prioritized cross-platform voice chat. Releasing on PS4 has been a long-time dream, and this dream was made possible with the assistance of Unity and Photon. Since we are bringing the game over from PC, in many cases it has been like flipping a switch to bring aspects of the game to PS4. We were lucky enough that we didn’t have to rebuild our UI from scratch, as the system was designed to be able to handle controller input. While we still created some custom pieces on top of this foundation, we did not end up in a position where we had to rebuild everything. Quite a bit of what we already had in place transitioned to PS4 seamlessly. However, the development process was not without its hiccups. Working on PS4 presented very different problems than we were used to on PC, where we get to decide where to optimize, and set the hardware requirements to match. On PS4 we have one set of hardware. In some respects, and that made things more challenging. Getting our CPU usage to a reasonable level took a lot of work, especially while maintaining identical gameplay for a cross platform title. On the other hand, that meant we always knew how far we could push the hardware, and we didn’t have to spend time worrying about players that might try and play on unique, old, or untested hardware. 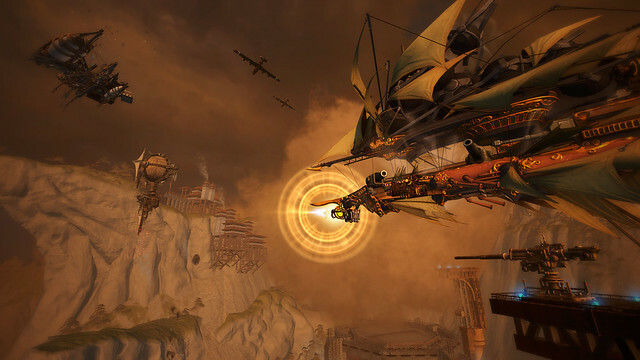 Guns of Icarus Alliance is about communication and community. We wanted to push the boundaries of what this means now, and what it can mean moving forward. We’ve been working towards this moment for a long time, and we can’t wait to share the skies with all you amazing PS4 players. So hyped for this to finally come out. It’s such a fun game to play with friends, and the absolute best steampunk-airship sim out there! Thanks a ton lunarcloud for the support! played it at PSX last year, it was ok .. hopefully its polished with PS4 pro support and 60fps .. this is great news for the dev team though as the game itself (on PC) is really good just has a low player base… looking forward to it. Hi BabakanooSH, thanks so much! Really appreciate the support!